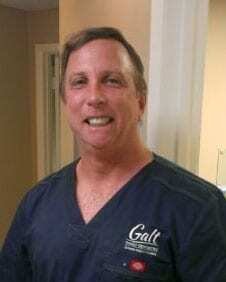 One of our most experienced team members, Dr. Pyser has been a member of Galt Family Dentistry for 39 years. He received his undergraduate and Master’s degrees at the University of South Florida and attended dental school at the University of Florida as a 1981 graduate. Dr. Pyser recognizes that no two situations are alike. Like a snowflake, each of his patients are completely unique and require different approaches to treatment. He enjoys using his artistic experience to help patients achieve their dental goals. Originally from Queens, New York, now that Dr. Pyser calls Florida home, he likes to stay athletically active, in addition to spending time with his wife and children.